Oral health is important. It impacts not just the look and health of your teeth, but the rest of your body as well. You’ve heard that electric brushes are better than manual brushes. But are electric toothbrushes worth it? In short, yes because they remove more plaque and can even whiten your teeth. Many electric brushes also come with cleaning modes, so you can choose a brushing style that meets your needs. Sonic: A sonic brush uses vibrations and side-to-side motion to remove plaque. Made famous by Philip’s Sonicare line, these brush heads look just like a manual brush. When brushing, you still need to actively move the brush in the same way you would with a manual toothbrush. Oscillating/Rotating: An oscillating and rotating brush has a small, round head that moves in a circular motion to remove plaque. The smaller brush head can reach in between teeth, and there’s no need to actively move the brush – just move it from one tooth to the other. These are the two main types of electric brushes, but you will find others that offer sweeping motions as well. Oral-B is best known for oscillating/rotating brushes, while Philips is best known for sonic brushes. Both offer excellent cleanings, but in their own unique ways. Finding the right electric toothbrush isn’t always easy, but we aim to make the process as painless as possible. We’ve reviewed some of the best brushes on the market to help you find the right one for your needs. 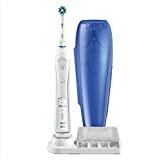 Oral-B Pro 5000 SmartSeries – From the #1 dentist-recommended brand, the Oral-B Pro 5000 SmartSeries actually features Bluetooth connectivity, so you can improve your brushing habits. The CrossAction brush head is round with angled brushes, which allows for a deep, thorough cleaning. The 3D cleaning action rotates, oscillates and pulsates to break up plaque better than a manual brush. The 2-minute timer makes sure that you brush for the dentist-recommended amount of time. Five cleaning modes are available: daily clean, gum care, deep clean, whitening and sensitive. A pressure sensor keeps you from brushing too hard, and the Oral B app helps you improve your brushing habits. The Oral-B Pro 5000 SmartSeries is the high tech electric brush that you want in your bathroom. 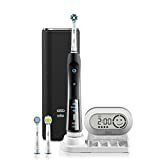 Philips Sonicare Essence – If you’re on a tighter budget, the Philips Sonicare Essence is the best cheap electric toothbrush you can buy. And with a battery life of two weeks, you won’t be charging this brush every other day. Using patented sonic technology, this brush pushes fluid in between teeth and along the gumline to remove more plaque than a manual brush. A 2-minute timer is built-in, too, so you get a thorough cleaning every time. There are no fancy cleaning modes included, and the brush is rather tall at 10”, but it’s affordably priced and the reminder bristles fade away over time to let you know when it’s time replace the brush head. If you want a no-frills electric brush that offers a superior clean, the Sonicare Essence is an excellent choice. Oral-B Pro 3000 – Another favorite from Oral-B, the Pro 3000 features the brand’s famous CrossAction brush head, which surrounds each tooth to reach in between teeth. With 3D cleaning action, the brush head oscillates, pulsates and rotates to remove and break up plaque. A pressure sensor is built-in to prevent you from brushing too hard, and a timer on the handle helps ensure that you brush for the recommended 2 minutes. The timer buzzes every 30 seconds to let you know that it’s time to move onto the next quadrant of your mouth. Three cleaning modes are built in: sensitive, daily clean and whitening. If you have a larger budget and want the extra cleaning modes, the Pro 3000 is worth the cost. Waterpik Complete Care – Forget to floss after you brush? The Waterpik Complete Care system will put an end to your flossing excuses. With a sonic toothbrush and effective water flosser, this system will keep your teeth looking their best. While the included sonic toothbrush is simple (no cleaning modes), it does offer a 2-minute timer with 30-second intervals, so you can brush your teeth properly every time. The included water flosser features a 90-second reservoir and the ability to adjust the pressure control system from 10-100psi. As an added bonus, a travel case is included for the brush, so you can take it with you on the go. And all of the included accessories can be stored in a special compartment in the reservoir. 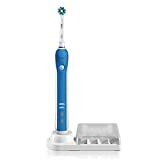 Oral-B Pro 7000 – The most advanced brush in Oral-B’s electric brush lineup, the Pro 7000 offers Bluetooth connectivity, several cleaning modes and the CrossAction brush head. The Oral-B app gives you real-time feedback on your smartphone, keeping you motivated, timing your brushing progress, tracking your brushing habits and letting you know if you’re brushing too hard. Four cleaning modes are included: deep clean, tongue clean, sensitive, gum care and whitening mode. On top of the app, the brush also has a built-in pressure sensor. The CrossAction brush head rotates, oscillates and pulsates to break up plaque. The 16 degree angle of the bristles allows you to get in between teeth for a deep clean every time. If you have a bigger budget, the Oral-B Pro 7000 is one of the best and most advanced electric brushes on the market. Brush type: What type of electric brush do you prefer: sonic or rotating/oscillating? Remember, oscillating brushes don’t require active movement, have smaller, round brush heads, and can reach in between teeth. Sonic brushes use vibrations and side-to-side motions to eliminate plaque, and their brush heads look like a regular toothbrush. Cleaning modes: Many electric brushes offer different cleaning modes to address your oral health needs. Gum care, for example, can help improve gum health in a gentle way. Whitening mode can help polish away stains. Daily care is great for everyday cleaning. Not all brushes offer cleaning modes, and some offer more than others. Determine which modes (if any) are important to you, and find a brush that offers what you’re looking for. Pressure sensors: Worried about brushing too hard? Brushing with too much pressure can damage the enamel on your teeth. Many brushes offer a built-in sensor that illuminates when you’re being too aggressive with your brushing. This feature can help keep your teeth even healthier. Timers: Dentists recommend brushing for two minutes at least twice per day, but most of us don’t time our brushing sessions. Many electric brushes have built-in timers to help ensure you brush long enough. Some have interval timers, too, which encourages you to brush each quadrant of the mouth for 30 seconds each. Price: Finally, you want to consider price. Buy the best brush you can afford, even if that means trading in cleaning modes for superior cleaning technology and durability.